Hazardous spills are a major contributor to serious injury on the highway, posing a problem for other motorists and resulting in traumatic accidents and fatalities. These incidents are taken very seriously by a truck accident law firm. Hazardous materials are hauled using tanker trucks. A commercial truck driver hauling this type of cargo requires special training. If the driver does not comply with the requirements to ensure safety, he or she is negligent. Let’s look at the types of hazardous materials and the dangers of each as well as the precautionary efforts that are expected of truckers and trucking companies dealing with this type of cargo. It is not enough to say an accident involving hazardous materials caused catastrophic injuries. A Los Angeles truck accident lawyer will investigate the way the company addressed issues surrounding hazardous substances. David Azizi will use his investigative skills to determine if the hazardous spill was the result of negligence by the truck driver or the trucking company. David has handled many cases involving truck accidents in the past and uses his broad knowledge to take the trucker or truck company to task if wrongdoing is found. Not only does he investigate the accident scene but he requests truck logs, training documents and the trucking company’s standard procedural rules for the safe transport of hazardous materials. It is important to remember that not taking such steps represents negligent behavior on the part of the driver and the trucking company. This is the cornerstone of a truck accident claim. By using this information to build a strong case, David enables the injured victim to recover the compensation he or she needs and deserves. While tanker trucks transport materials ranging from milk to maple syrup, they also transport materials that are hazardous to health and safety. Hazardous materials include gas, oil or other items that are chemical, biological or radiological in nature and that can result in harm to living beings as well as the environment. All hazardous materials are regulated by several governmental agencies, including the Department of Transportation, the Environmental Protection Agency and the Occupational Safety and Health Administration. Federal, state and local agencies regulate that part of the trucking industry that hauls hazardous materials. For example, OSHA is involved once the hazardous material is on the ground, and the DOT covers hazardous material transportation. Together, all the agencies, both federal and state, help keep individuals safe. In order to haul hazardous materials, a trucking company or private truck owner must have a hazardous materials transportation license. This license is issued by the California Highway Patrol (CHP). The license must be carried onboard the vehicle at all times. In addition to the license, a Hazmat registration must be available. A driver needs a CDL license with an endorsement to haul hazardous materials to qualify as a hazardous material hauler. In order to receive the endorsement, the trucker must pass a test provided by the state of California. Aside from passing a written test, a driver must receive adequate training in hazardous material hauling provided by the employer. The owner of the trucking company must maintain logs of training sessions for each employee. Lack of training is a vital factor in charging a defendant with liability for accident injuries. Retraining is required every three years. If training is not provided, the employer can be cited. In addition to basic training in hazardous material hauling, drivers must also receive training in how to recognize and handle security risks. Special training is required for those hauling flammable gas and radioactive materials. All truck drivers hauling hazardous substances need to know what to do if a spill occurs. Spills can occur during any stage in the hauling process from loading through transportation and unloading. Different substances require different types of cleanup. During training, provided by the employer, the trucker learns how to use a spill kit to contain a spill. Large spills cannot be contained easily, and experts in spill cleanup are usually active on site. After cleanup, truckers must also know where and how to dispose of the waste materials. If done incorrectly, both the driver and the trucking company can be subject to penalties. Depending on the type of spill, serious injuries and death can occur. Chemical substances can cause burns and carcinogenicity, and flammable substances result in explosive forces that can result in burns and death. Many hazardous substances can cause environmental damage. If a tanker is partially filled, the liquid will have the capacity of moving about in the tank, an event referred to as sloshing. When a trucker brakes, the rear wheels can lock, causing loss of control. Alternately, if the driver abruptly changes lanes, it can result in rollover. Subdivisions within the tank can reduce the effect of sloshing. Drivers are trained in ways to reduce the risk of accidents by regaining control of the vehicle should sloshing occur. 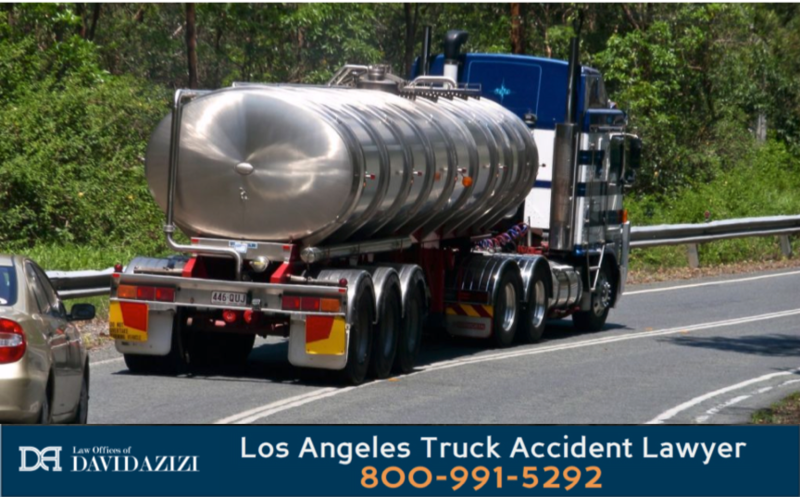 If you have been injured by a hazardous material content spill, you need the legal representation David Azizi, a tanker truck accident lawyer, can provide. Call him at 800-991-5292 anytime, day or night. We know that accidents do not happen only between the hours of nine to five. Immediately, David will make arrangements to review your case. He will investigate the accident for evidence of negligence, reviewing documents and logs to make sure that safety precautions were followed. Whether by using accident reconstruction efforts, police and regulatory agency reports and witness accounts, David will build a firm understanding of liability in the accident. 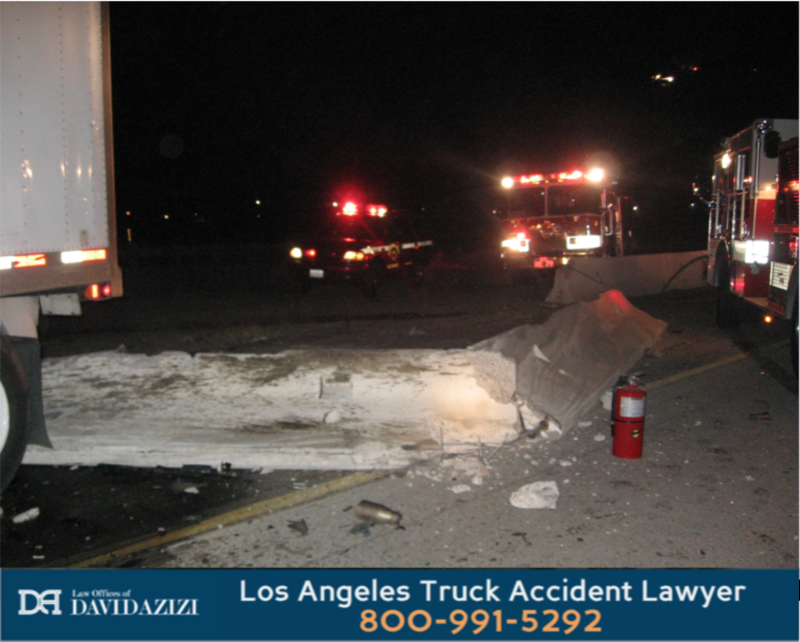 Don’t wait to call, since evidence may disappear as the accident scene is cleared and witness memory fades. There is no charge for the initial consultation, and you will not pay a cent until after your case is won.